Leicester City's players did not let down sacked manager Claude Puel, says Foxes first-team coach Mike Stowell. The Frenchman was dismissed after 16 months in charge following Saturday's 4-1 defeat by Crystal Palace. He left the club 12th in the Premier League having lost five of their past six league games. "The results are poor, but the performances have been good," said Stowell, who is in temporary charge alongside Adam Sadler. "It's always sad when a manager loses his job but I wouldn't say that the players let him down. "We just didn't get the rub of the green sometimes and when mistakes happen they are not made deliberately." 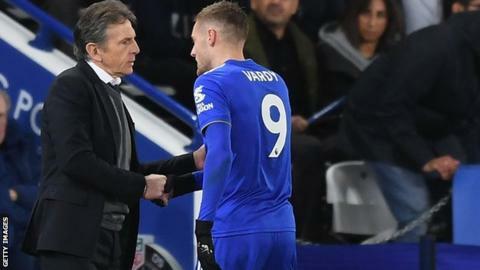 Puel guided Leicester to a ninth-place finish in the English top flight in his first season but the club are now looking for their fourth manager in 23 months. In a statement, 57-year-old Puel, who took over in October 2017, said it had been an "honour" to manage the club. "I really appreciate the willingness to learn and work ethic of all of the players and I have no doubt that they will all have bright futures," he said. Stowell said Puel had the "club at heart", adding: "He brought several good things to the club. "The players are disappointed with the results and are angry with the performances. They're not angry with the boss." Speaking at a news conference before Leicester host Brighton in the league on Tuesday (19:45 GMT), Stowell said: "I've spoken to the players and told them how good they are and reminded them that they are a top-seven team. That's where we should be and that's where we should be aiming to get back to." Newcastle manager Rafael Benitez is out of contract this summer and has been linked with the vacant Foxes job, alongside Celtic boss Brendan Rodgers and ex-Hibernian manager Neil Lennon, who spent four seasons with Leicester as a player. Asked about the shortlist for the vacancy at the King Power Stadium, Benitez said: "Short? It's not very short, it's quite long now." "I think you know my answer. I am really focusing on the next games."